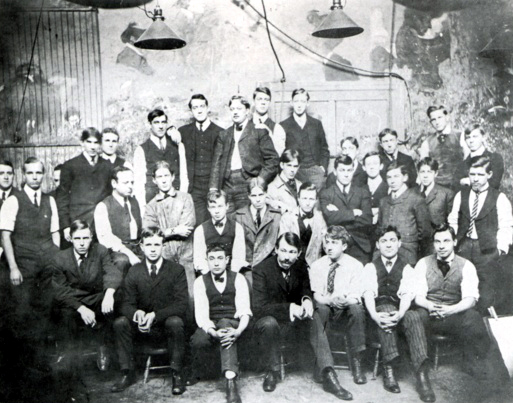 Chatterton is seen sitting in the second row, behind the third and fourth people from the right in the front row. Robert Henri is the mustached man in the front row. Edward Hopper is seated behind Henri, to Chatterton's right. From very early in his life Chatterton wanted to be an artist. Although his father, a lawyer, disapproved of art as a career, the older Chatterton sent his son to study with a Newburgh painter. In later years Chatterton said of his father, "Father told me it was all right to do this just as a hobby, but he didn't want me to be an artist because artists starve. So I had this feeling all the time I was going to school. 'Someday I'm going to starve.' But, I never did starve ... or come anywhere near it." Chatterton's father died in 1893. By 1899, the young man had decided he wanted to be an illustrator because "that's where the money was." For that reason, Chatterton chose the New York School of Art, or Chase School, as it was often called after its founder and principal instructor, William Merritt Chase. Howard Chandler Christy and Walter Appleton Clark, both famous illustrators, were on the faculty there. It was at the New York School of Art that Chatterton began lifelong friendships with Rockwell Kent, Gifford Beal, and Edward Hopper. Hopper, who was two years younger than Chatterton, looked up to "Chat" as an older brother and followed him around like a puppydog. It was Hopper who first realized that Chatterton would be wasting considerable artistic talent if he devoted himself exclusively to a career in illustration. One day, in the fall of 1901, Hopper walked into Chatterton's illustration class, handed him a palette and brushes, and said, "Chat, it's time you started to paint." Chatterton always said, "That was the day I began to paint and I've been painting ever since." In the 1960s, when he was in his eighties, Chatterton dictated his recollections of The Chase School to his daughter, Julia Chatterton VandeWater. The resulting document, There Never Was A School Like It, may be read by clicking here.